The RSS Items content block allows you to easily pull information from your RSS feed into your RSS campaign. Use in combination with the RSS Header block to automatically bring feed content, like blog posts, into your campaign layout. Based on the send options you set for your RSS campaign, we'll send out emails with new content as posts are added and the feed is updated. Navigate to the Design step of the Campaign Builder. 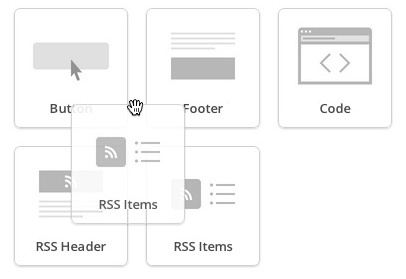 Click and drag the RSS Items block into your campaign layout. On the Content tab, choose Custom from the RSS Items Style drop-down menu. Excerpts, Titles Only, and Full Content pull in preset RSS merge tags. Select show the markup to see the code that creates the preset content. This code cannot be edited, but it can be copied and pasted into a custom-coded template, or into the source code of a Text or Boxed Text block. To edit the content within the RSS Items block, choose the Custom option. Make any additional style changes. Click the RSS Item s block you want to edit to bring up the editing pane. 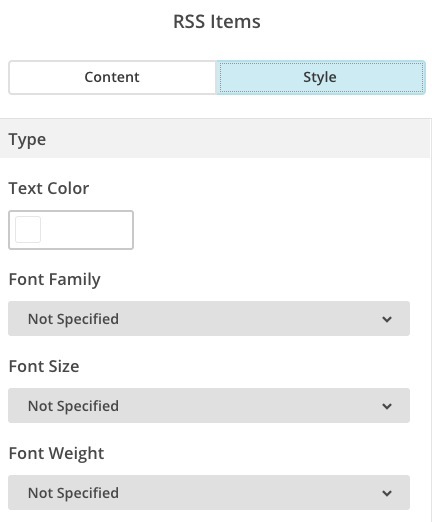 On the Style tab, set styles for the text, including font color, type, size and weight, line height, and text alignment. Use Mailchimp's RSS Header block to easily pull content from your RSS feed into your campaign. 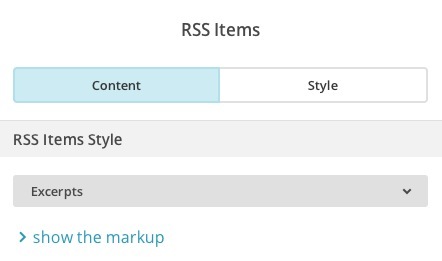 Learn how to add, edit, and style content in RSS Header blocks. Learn how to create an RSS campaign with Mailchimp's Campaign Builder.